There’s no doubt that summer is usually a time of refreshment. As the sun gets brighter and the days become longer, we all have an urge to slow down and relax. With fall representing a time of hustle for many, the holiday season filled with more hustle and bustle, and the spring being a time of renewal, summer usually poses the perfect time to relax and take a break. Cookout and festival season has begun. We look forward to the vacations, late summer nights, and the lax schedules that allow us to live in the moment and pause the busyness of everyday life. And while those vacations and breaks are needed, should they apply to our goals too? While rest and refreshment are needed, it’s important that you don’t let summer break be an excuse to postpone your goals. This may arguably be the best time to make them happen. During the summer, you typically have the most margin in your schedule. Everybody loosens up during the summertime. Nobody wants to be stuck inside the house, the office, or even the city. Think about it, this is the time of the year when most people go on vacations, organizational and church activities take a break, and most people want to enjoy the warm weather. Therefore you have fewer places to be and fewer things to do. When you don’t have too much going on or too many places to be is the perfect time to take action on your goals. Make sure that you schedule intentional time to work on your goals during the summer. Don’t get caught up in the summer daze. The best way to make more headway with your goals is to schedule the time you will devote to working on them. Set aside time each week to have a goal date where you assess your goals progress. Otherwise, before you know it, it will be the end of the summer and you’ll have more barbecues checked off your list than goals. Plan around any vacations or summer activities. Just because you’re working on your goals, doesn’t mean that you have to skip out on the summer fun. Make sure that you pencil in any planned vacations or events, so you can still enjoy yourself while making the most of your summer schedule. Consider paring down your process during the summer. Can you eliminate any extraneous steps or to-dos? Are you overcomplicating any of your action steps? Break down your goals into super simple action steps. You don’t need to go through a production process to achieve your goals. Simplicity is always the best route. If your goals feel like a burden to you, it’s time to reassess them. Why do they matter to you? Why do you want to achieve them? What are your motives? Did you set your goals because they are important to you or someone else? One of the best ways you can guarantee that you will take action on your goals is to own them while having fun. 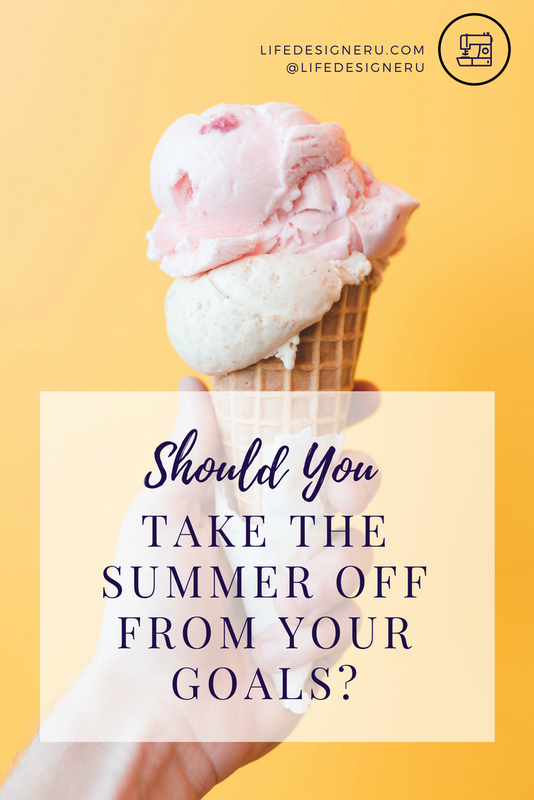 Instead of thinking about taking a summer off from your goals, consider having a summer on. A summer where you can rest and have fun while making the most of the time you have to make progress toward your goals. Need support in the process? Sign up for a complimentary Clarity Session to identify your opportunities, gain clarity, and get accountability and structured support for your goals. How do you plan on taking action on your goals this summer?